The prompt diagnosis of systemic vasculitis is essential as a missed diagnosis can be disastrous. Imaging is of vital importance in achieving a correct diagnosis and in some cases also plays a role in endovascular treatment. 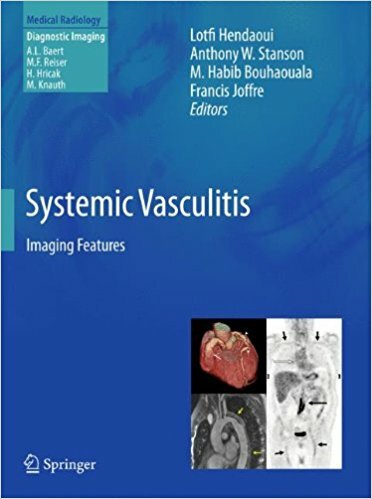 In this book, the imaging features of the many different types of vasculitis are clearly demonstrated by means of numerous high-quality illustrations. All relevant imaging modalities are considered, and key distinctive characteristics are highlighted. In addition, each chapter discusses the etiology, epidemiology, pathogenesis, clinical presentation, biology, and treatment of the vasculitis in question. This book is the result of cooperation between expert teams from a range of countries. The wealth of illustrations and informative clinical case studies will prove invaluable for all who may be confronted with these problematic disorders.